Acquisition History: A water-control structure was built on the site of the Cascade Marsh WMA in 1958 during a time when the NH Fish and Game Department leased the land. Land acquisitions began in 1972 and continued until 1991, when a 118-acre conservation easement was purchased withduck stamp revenues and LCIP funds. Chadwick Meadows WMA was donated to the Department in 1981. Description: Cascade Marsh WMA includes a 70-acre shallow-water impoundment vegetatedwith cattails, pickerelweed and other emergent vegetation. The upland habitat is diverse, and includes balsam fir, white pine, hemlock, red maple and aspen. The 100-acre Chadwick Meadows WMA includes a 25-acre waterfowl impoundment with forested wetlands and shallow marsh emergent vegetation. The upland surrounding the marsh has hemlock, white pine and early successional species such as aspen, cherry, red maple and old apple trees. Common Wildlife: The upland habitats at these WMAs support white tailed deer, black bear, moose, ruffed grouse, woodcock and snowshoe hare. The marshes support a variety of wetland wildlife, particularly Canada geese, black ducks, mallards, wood ducks, beaver, muskrat and pied-billed grebes. Both marshes have a very limited warmwater fishery. Special Notes: The primary objective at Cascade Marsh is to maintain the impoundment to create habitat for waterfowl. There is an active gravel pit beyond the locked gate. Do not block the gate; use the parking area. 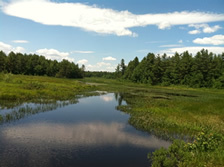 The western side of the marsh is a 118-acre conservation easement, which the NH Fish and Game Department manages but does not own. There are special deed restrictions at Chadwick Meadows. Deer can be taken by bow and arrow only. All other game species can be taken with a bow and arrow or with a shotgun using shot no larger than No. 4. Directions: There are two locations to access Cascade Marsh WMA. To access the dam site from I-89, take Exit 10. Turn right onto North Rd and travel 0.4 miles. Turn left onto Kearsarge Valley Rd and travel for 1.7 miles. Slight left on Baker Rd. Drive 1.3 miles on Baker Rd to an orange gate, sign, and parking area on your left. Walk approximately 400 feet to the dam site. The gate is opened for the 1st part of the waterfowl season every year to provide for easier canoe/small boat access. An alternative access to the marsh is off of Cotton Rd. Head south on Baker Rd from the dam site parking area. Take your first right onto Cotton Rd. Cotton Rd crosses the marsh approximately 700 feet down the road. Parking is roadside. Decent car top canoe access at this location.